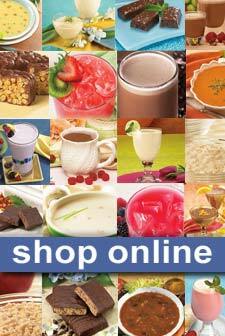 Cinco de Mayo or anyday when you’re craving Mexican food look no further. Spray a non-stick skillet with cooking spray and heat oil over medium heat. Add the onion and garlic and cook until fragrant (about 5 minutes). Add the ground turkey and the packet of seasoning and stir as this cooks to mix the seasonings. Prepare the salad: Layer the cooked turkey on the lettuce and top with chopped tomatoes, cucumbers, and peppers. 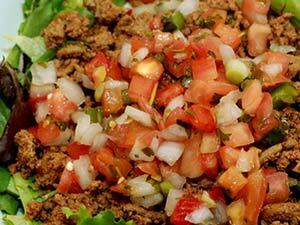 Prepare the dressing: In a small bowl mix the chili powder, oregano, salt, cilantro, salsa and lime juice. Mix well and dress each salad. Garnish with extra lime wedges. 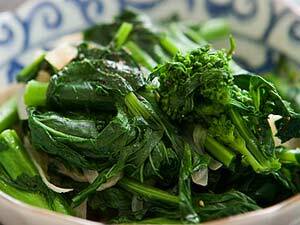 Bring salted water to a boil over medium high heat and cook the broccoli rabe until tender, about 5 minutes. Heat 1 tbsp olive oil with garlic and a pinch of red pepper flakes in a skillet over medium high heat. Add mushrooms and cook until golden brown, about 2 minutes. Add 1 tbsp olive oil and broccoli rabe and cook for 5 more minutes. Season with a pinch of salt. non-stick and makes clean up a breeze. 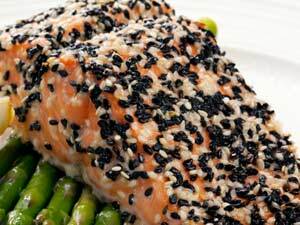 Arrange salmon in a single layer on a rimmed baking sheet coated with cooking spray. Combine seeds and a pinch of salt; sprinkle over the fish. Bake for 14 minutes or until done. Melt butter substitute in a saucepan over medium heat. Add oil and swirl to coat. Add onions and cook for 2 minutes. Add lemon slices and cook for 2 minutes. Sprinkle onions with salt and pepper. Place the arugula in a medium bowl and add the warm onion mixture;toss. Divide the arugula evenly onto 4 plates and top with one salmon fillet.